Fifteen strangers walk into a bar, each determined to meet everyone else before the evening is over. How many different ways might they accomplish this? All joking aside, there are 1,307,674,368,000 ways that any one individual could meet the other 14 strangers, without encountering anyone twice. Four unique ways Mr. Pink could meet all 14 fellow party-goers. To show all 1,307,674,368,000 permutations would require making similar minimal changes one by one. 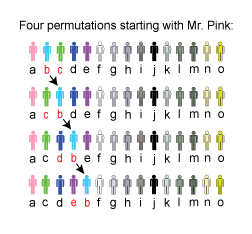 The figure also suggests similar unique variations in the way you could read 15 episodes of a story at random. A spreadsheet program makes it easy to calculate permutations. Fortunately no math is necessary for real-life party-goers, or readers, and a mere 15 decisions is enough to eliminate the vast majority of possible choices. * A mathematical permutation is an arrangement of objects (people, for example) in a specific order. In this case, no repetition is allowed within each set of 15 decisions because we assume that no two party guests meet more than once and no reader of You Will All Be Punished Unless the Guilty Party Confesses returns to an episode already read. What’s your child’s storytime preference–paper or glass? Is laziness a uniquely human trait? Heard any good voices lately? How long does it take a book to be born?